You can install Red Hat Enterprise Linux on a large variety of storage devices. You can see basic, locally accessible, storage devices in the Installation Destination page, as described in Section 17.15, “Installation Destination”. To add a specialized storage device, click the Add a disk button in the Specialized & Network Disks section of the screen. Basic storage devices directly connected to the local system, such as hard disk drives and solid-state drives, are seen in the Local Standard Disks section of the screen. On IBM Z, this contains activated Direct Access Storage Devices (DASDs). A known issue prevents DASDs configured as HyperPAV aliases to be automatically attached to the system after the installation finishes. These storage devices will be available on this screen during the installation, but will not be immediately accessible after you finish installing and reboot. To attach HyperPAV alias devices, add them manually to the system's /etc/dasd.conf configuration file as described in Section 19.1.3, “Persistently Setting DASDs Online”. The storage device selection screen displays all storage devices to which the Anaconda installation program has access. Any other devices available on a Storage Area Network (SAN) such as FCP LUNs attached over one single path. Storage devices attached to a firmware RAID controller. This tab does not apply to IBM Z. This tab contains storage devices, or Logical Units (LUNs), attached through the zSeries Linux FCP (Fiber Channel Protocol) driver. The overview page also contains the Search tab that allows you to filter storage devices either by their World Wide Identifier (WWID) or by the port, target, or logical unit number (LUN) at which they are accessed. The Search tab contains the Search By drop-down menu to select searching by port, target, LUN, or WWID. Searching by WWID or LUN requires additional values in the corresponding input text fields. Click the Find button to start the search. Each device is presented on a separate row, with a check box to its left. Click the check box to make the device available during the installation process. 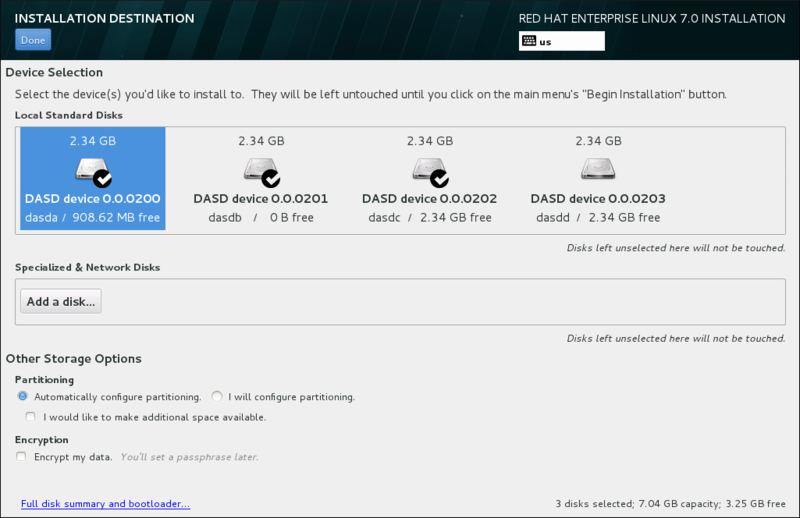 Later in the installation process, you can choose to install Red Hat Enterprise Linux onto any of the devices selected here, and can choose to automatically mount any of the other devices selected here as part of the installed system. Note that the devices that you select here are not automatically erased by the installation process. Selecting a device on this screen does not, in itself, place data stored on the device at risk. Also note that any devices that you do not select here to form part of the installed system can be added to the system after installation by modifying the /etc/fstab file. When you have selected the storage devices to make available during installation, click Done to return to the Installation Destination screen. In the dialog, you can click Cancel to return to the Installation Destination screen and edit disk selection. If the selection is correct, click the Format with dasdfmt button to launch the dasdfmt utility on all unformatted DASDs. When the formatting process is complete, clicking the OK button brings you back to the Installation Destination screen where the list of DASDs will be refreshed. You then need to re-select your disks for the installation to proceed. To automatically allow low-level formatting of unformatted online DASDs, specify the Kickstart command zerombr. See zerombr (optional) for more details. When installing Red Hat Enterprise Linux on IBM Z with the FBA DASD CMS disk layout as the target, only three partitions are allowed. The installer first creates an msdos partition table on the target DASD. The table does not allow more than three partitions on one DASD device. You can create the partitions manually or use the autopart --nohome Kickstart option, which ensures that the installer does not create a separate /home/ partition. The absence of the home directory keeps the number of partitions at three. To use an advanced storage device, you can configure an iSCSI (SCSI over TCP/IP) target or zFCP (zSeries Fibre Channel Protocol) LUN (logical unit) by clicking the appropriate button in the lower right corner of the Installation Destination screen. See Appendix B, iSCSI Disks for an introduction to iSCSI. When you click the Add iSCSI target... button, the Add iSCSI Storage Target dialog appears. To use iSCSI storage devices for the installation, Anaconda must be able to discover them as iSCSI targets and be able to create an iSCSI session to access them. Each of these steps might require a user name and password for CHAP (Challenge Handshake Authentication Protocol) authentication. Additionally, you can configure an iSCSI target to authenticate the iSCSI initiator on the system to which the target is attached (reverse CHAP), both for discovery and for the session. Used together, CHAP and reverse CHAP are called mutual CHAP or two-way CHAP. Mutual CHAP provides the greatest level of security for iSCSI connections, particularly if the user name and password are different for CHAP authentication and reverse CHAP authentication. Repeat the iSCSI discovery and iSCSI login steps as many times as necessary to add all required iSCSI storage. However, you cannot change the name of the iSCSI initiator after you attempt discovery for the first time. To change the iSCSI initiator name, you must restart the installation. 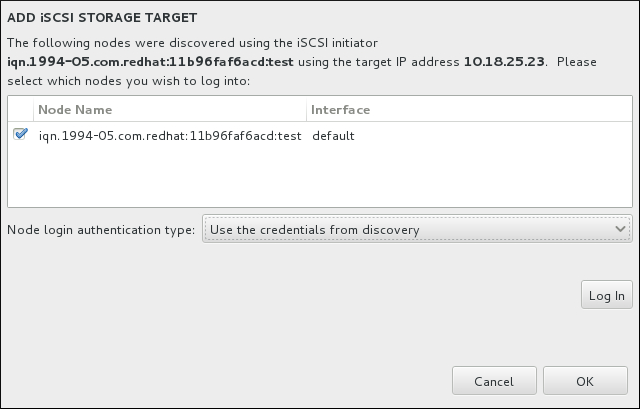 Use the Add iSCSI Storage Target dialog to provide Anaconda with the information necessary to discover the iSCSI target. a date code that specifies the year and month in which your organization's Internet domain or subdomain name was registered, represented as four digits for the year, a dash, and two digits for the month, followed by a period. For example, represent September 2010 as 2010-09. A complete IQN can therefore look as follows: iqn.2010-09.storage.example.com:diskarrays-sn-a8675309 . Anaconda prepopulates the iSCSI Initiator Name field with a name in this format to help you with the structure. For more information on IQNs , see 3.2.6. iSCSI Names in RFC 3720 - Internet Small Computer Systems Interface (iSCSI) available from http://tools.ietf.org/html/rfc3720#section-3.2.6 and 1. iSCSI Names and Addresses in RFC 3721 - Internet Small Computer Systems Interface (iSCSI) Naming and Discovery available from http://tools.ietf.org/html/rfc3721#section-1. 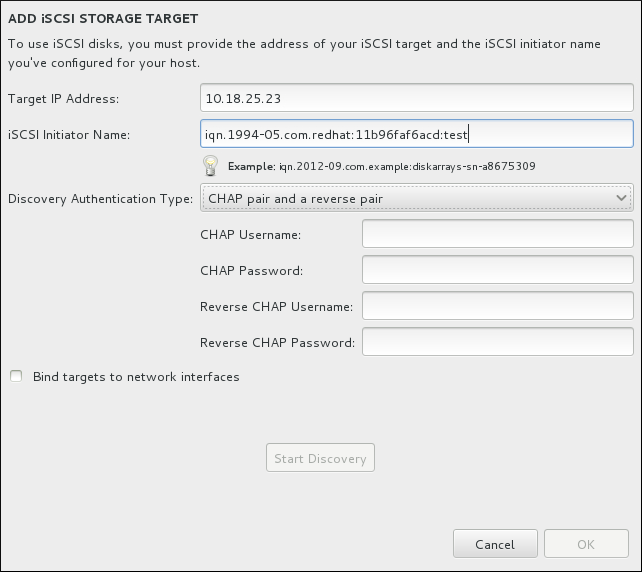 If you selected CHAP pair as the authentication type, provide the user name and password for the iSCSI target in the CHAP Username and CHAP Password fields. If you selected CHAP pair and a reverse pair as the authentication type, provide the user name and password for the iSCSI target in the CHAP Username and CHAP Password field and the user name and password for the iSCSI initiator in the Reverse CHAP Username and Reverse CHAP Password fields. Optionally check the box labeled Bind targets to network interfaces. Click the Start Discovery button. Anaconda attempts to discover an iSCSI target based on the information that you provided. If discovery succeeds, the dialog displays a list of all iSCSI nodes discovered on the target. Each node is presented with a check box beside it. Click the check boxes to select the nodes to use for installation. The Node login authentication type menu provides the same options as the Discovery Authentication Type menu described in step 3. However, if you needed credentials for discovery authentication, it is typical to use the same credentials to log into a discovered node. To do that, use the additional Use the credentials from discovery option from the menu. When the proper credentials have been provided, the Log In button becomes available. Click Log In to initiate an iSCSI session. After clicking the Add DASD button at the Installation Destination screen, a dialog appears for you to add a DASD (Direct Access Storage Device) storage device. 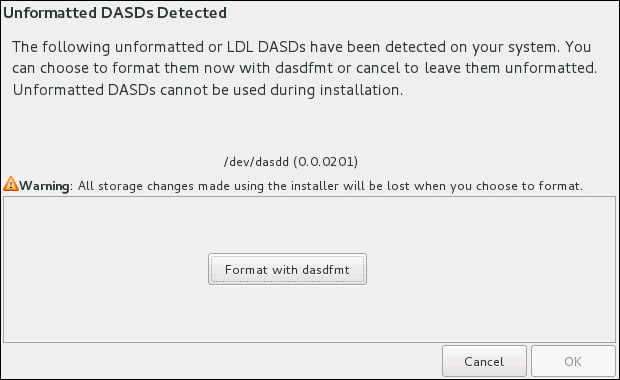 This dialog allows you to attach additional DASDs which were not detected when the installation started. 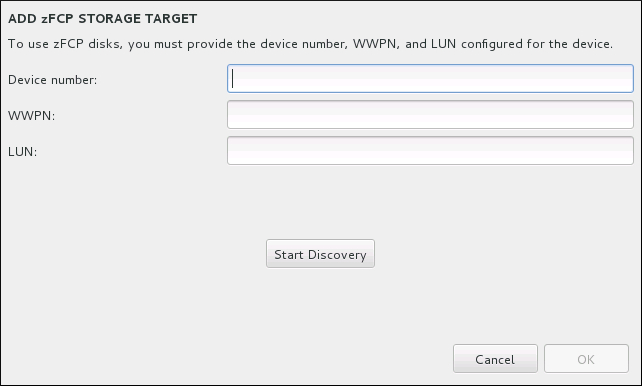 The Add DASD Storage Target dialog prompts you to specify a device number, such as 0.0.0204. Enter the device number of the DASD you want to attach, and click Start Discovery. If a DASD with the specified device number is found, and if it is not already attached, the dialog window will close and the newly discovered drives will appear in the list of drives in Section 17.16.1, “The Storage Devices Selection Screen”. There, you can use the check boxes on the left side of the screen to select which of the drives should be made available; after you do so, press Done in the top left corner to return to Section 17.15, “Installation Destination”. The new DASDs will then be available for selection (marked as DASD device 0.0.xxxx) in the Local Standard Disks section of the screen. If you entered an invalid device number, or if the DASD with the specified device number is already attached to the system, an error message will appear within the dialog window, explaining the error and prompting you to try again with a different device number. When you click the Add ZFCP LUN button, a dialog appears for you to add a FCP (Fibre Channel Protocol) storage device. FCP devices enable IBM Z to use SCSI devices rather than, or in addition to, Direct Access Storage Device (DASD) devices. FCP devices provide a switched fabric topology that enables IBM Z systems to use SCSI LUNs as disk devices in addition to traditional DASD devices. IBM Z requires that any FCP device is entered manually for the installation program to activate FCP LUNs. This can be done either in Anaconda interactively, or specified as a unique parameter entry in the parameter or CMS configuration file. The values entered here are unique to each site in which they are set up. Interactive creation of an FCP device is only possible in graphical mode. It is not possible to interactively configure an FCP device in a text mode installation. Use only lower-case letters in hex values. If you enter an incorrect value and hit the Start discovery button, the installation program will display a warning and allow you to edit the configuration information and retry the discovery attempt. For more information on these values, consult the hardware documentation and check with the system administrator who set up the network for this system. To configure a Fiber Channel Protocol SCSI device, fill in the 16-bit device number, 64-bit World Wide Port Number (WWPN), and 64-bit FCP LUN identifier. Click the Start Discovery button to connect to the FCP device using this information. The newly added devices are displayed in the System z Devices tab of the Installation Destination screen. For a SCSI-only installation, remove the DASD= from the parameter or CMS configuration file to indicate no DASD is present. When you click the Add FCoE SAN... button, a dialog appears for you to configure network interfaces for discovering FCoE storage devices. First, select a network interface that is connected to a FCoE switch in the NIC drop-down menu and click the Add FCoE disk(s) button to scan the network for SAN devices. Data Center Bridging (DCB) is a set of enhancements to the Ethernet protocols designed to increase the efficiency of Ethernet connections in storage networks and clusters. Enable or disable the installation program's awareness of DCB with the check box in this dialog. This option should only be enabled for network interfaces that require a host-based DCBX client. Configurations on interfaces that implement a hardware DCBX client should leave this check box empty. Auto VLAN indicates whether VLAN discovery should be performed. If this box is checked, then the FIP (FCoE Initiation Protocol) VLAN discovery protocol will run on the Ethernet interface once the link configuration has been validated. If they are not already configured, network interfaces for any discovered FCoE VLANs will be automatically created and FCoE instances will be created on the VLAN interfaces. This option is enabled by default. Discovered FCoE devices will be displayed under the Other SAN Devices tab in the Installation Destination screen.